The report is based on recent surveys conducted by the Frontier Group of nearly 1,700 vehicles CarMax advertised for sale in Northern and Southern California, Massachusetts, and Connecticut, compared with data about CarMax’s sales of unrepaired recalled cars in those states in 2015. The report also found that more than one in four cars for sale on the surveyed lots have unrepaired safety recalls. “CarMax is selling huge numbers of unsafe, defective recalled cars that are ticking automotive time bombs. They pose a serious threat to the safety of all American motorists and their families,” said Rosemary Shahan, President of the Consumers for Auto Reliability and Safety (CARS) Foundation, a non-profit auto safety organization based in Sacramento, CA. “Recalls happen when there is an unreasonable safety risk or the car fails to meet a safety standard. Evidence of these defects is readily available to CarMax and calling an unrepaired recalled car ‘safe’ is deceptive on its face,” said Jason Levine, Executive Director of the Center for Auto Safety, an independent, non-profit consumer advocacy organization based in Washington, DC. The consumer groups are calling on state law enforcement officials to curb CarMax’s sales of unsafe recalled cars, and on the Courts to overturn consent orders finalized by the Federal Trade Commission which allow dealers including CarMax to advertise that unsafe vehicles with unrepaired safety recalls are “safe,” “repaired for safety,” and passed a “rigorous inspection” and are offered for sale as “certified” cars, without getting the free repairs, if they merely disclose that the cars they offer for sale “may” have an “open recall.” Consumers for Auto Reliability and Safety, USPIRG, and the Center for Auto Safety are suing the FTC to get the consent orders overturned. The case is pending before the U.S. District Court in Washington, D.C.
CarMax sometimes does not present the “disclosure” form to car buyers until AFTER they have already signed a purchase contract. That is what happened to safety advocate Sean Kane, who purchased a Jeep from CarMax in North Attleboro, MA, in 2015. He shopped for the car with his 15-year-old son, and told sales personnel that it was very important to have a safe vehicle for his son to drive. CarMax did not present him with the recall “disclosure” form until AFTER he had already signed the purchase contract. 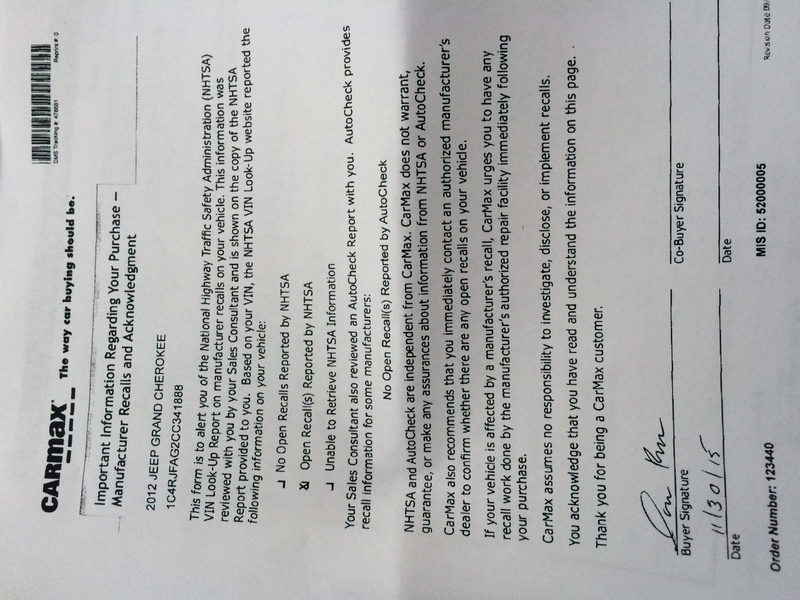 The “disclosure” form itself was false and misleading, indicating that according to NHTSA there was an “open recall(s)” but according to AutoCheck there was NO safety recall. In fact, the Jeep CarMax sold him had 3 unrepaired safety recalls – it was prone to catching on fire, had faulty brakes, and was prone to stalling in traffic.